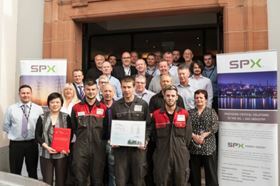 SPX Flow Power & Energy ClydeUnion Pumps’ Glasgow workers. The award recognises ClydeUnion Pumps’ design, manufacturing, service and support. The two companies have had a longstanding, successful relationship. Since 2006, ClydeUnion Pumps has delivered 146 pumps for nuclear applications to CNPEC in China.